Delivery of the Tu-16 to China began in 1958, and the Xi'an Aircraft Industrial Corporation (XAC) signed a license production agreement with the USSR to build the type in the late 1950s. The first Chinese Tu-16, or "H-6" as it was designated in Chinese service, flew in 1959. Production was performed by the plant at Xian, with at least 150 built into the 1990s. China is estimated to currently operate around 120 of the aircraft. The latest version is the cruise missile-carrying H-6K which gives China a strategic bomber able to attack heavily defended targets throughout Asia. The first domestically produced H-6 was completed in 1968 and evidence of bombing training was recorded by U.S. spy satellites on Aug. 13. 1971. By March of the following year, the CIA estimated that the PRC had 32 aircraft operational with an additional 19 awaiting completion. The H-6 was used to drop nine nuclear devices at the Lop Nur test site. However, with the increased development in ballistic missile technology, the nuclear delivery capabilities that the H-6 offered diminished in importance. The CIA estimated in 1976 that the H-6 had moved over to a dual nuclear/conventional bombing role. 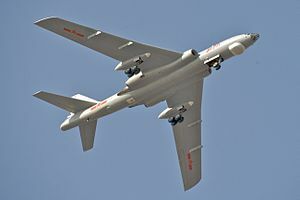 Along with the H-6 free-fall bomber, an "H-6A" nuclear bomber was built, as well as an "H-6B" reconnaissance variant, "H-6C" conventional bomber and "H-6E" nuclear bomber with improved countermeasures, and the "H-6D" antiship missile carrier. The H-6D was introduced in the early 1980s and carried a C-601 antishipping missile (NATO codename "Silkworm", an air-launched derivative of the Soviet P-500 Permit / NATO "Styx") under each wing. The H-6D featured various modernized systems and sports an enlarged radome with a Type 245 Kobalt I-band surveillance radar under the nose. The Type 245 radar was based on the Soviet PSBN-M-8 NATO codenameMushroom radar used on the Tupolev Tu-16. Earlier versions (Type 241, 242 and 244) were installed on the early models of the H-6. The H-6 has also been used as a tanker and drone launcher. Later H-6 production featured extended curved wingtips. Many H-6A and H-6C aircraft were updated in the 1990s to the "H-6F" configuration, the main improvement being a modern navigation system, with a Global Positioning System (GPS) satellite constellation receiver, Doppler navigation radar, and inertial navigation system. New production began in the 1990s as well, with Xian building the "H-6G", which is a director for ground-launched cruise missiles; the "H-6H", which carries two land-attack cruise missiles; and now the "H-6M" cruise missile carrier, which has four pylons for improved cruise missiles and is fitted with a terrain-following system. Apparently these variants have no internal bomb capability, and most or all of their defensive armament has been deleted. 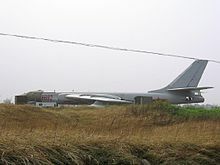 The H-6K, first flying on 5 January 2007, entered service in October 2009 during the celebrations of the 60th anniversary of the People's Republic of China,, and is claimed to give China its first proper strategic bomber. With a reinforced structure making use of composite materials, enlarged engine inlets for Russian NPO Saturn D-30KP-2 turbofan engines giving a claimed range of 3,500 kilometres (2,200 mi), a glass cockpit, and a reworked nose section eliminating the glazed navigator's station in favour of a more powerful radar, the H-6K is a significantly more modern aircraft than earlier versions. The bomb bay has been replaced by extra fuel capacity, and six underwing pylons for CJ-10A cruise missiles are fitted. 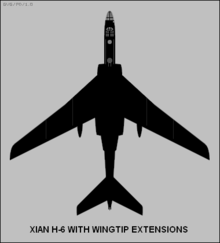 In January 2009, it was reported that an indigenous turbofan engine, the WS-18, was under development for use in the H-6K..
Xian H-6 - Conventional bomber. Tupolev Tu-16 produced under license in China, first flew in 1959. A prototype conducted China’s first aerial nuclear weapon test at Lop Nor on 14 May 1965. Xian H-6A - Nuclear bomber. Xian H-6B - Reconnaissance variant. Xian H-6C - Conventional bomber with improved counter-measures suite. Initially designated H-6III. Xian H-6D - Anti-ship missile carrier introduced in early 1980s, armed with two air-launched C-601 missiles, one mounted under each wing. Fitted with larger radome under the nose and various improved systems. Picture - PLAAF Xian H-6 parked on the ground. Later upgraded to either two C-301 supersonic anti-ship missiles, or four C-101 supersonic anti-ship missiles.An upgraded version, capable of carrying four YJ-8 (C-801) anti-ship missiles is currently under development. Initially designated H-6IV. Xian H-6E - Strategic nuclear bomber with improved counter-measures suite, entered service in 1980s. Xian H-6F - New designation for upgraded H-6A and H-6C. Many aircraft upgraded in the 1990s with new Inertial navigation systems, doppler navigation radar and GPS receiver. Xian H-6G - Provides targeting data to ground-launched cruise missiles, built in the 1990s. No internal bomb bay or defensive armament. Xian H-6H - Land-attack cruise missile carrier armed with two missiles, built in the 1990s. No internal bomb bay or defensive armament. Xian H-6M - Cruise missile carrier, fitted with terrain-following system and four under-wing hardpoints for weapons carriage. No internal bomb bay or defensive armament. Production of this variant is believed to have resumed in early 2006. Xian HD-6 (Hongzhaji Dian-6) - Electronic warfare version with solid nose and canoe fairing believed to contain electronic counter-measures equipment. Xian H-6K - Latest H-6 variant, re-engined with D-30KP turbofan engines of 12,000 kg thrust replacing the original Chinese turbojets. Other modifications include larger air intakes, re-designed flight deck with smaller/fewer transparencies and large die-electric nose radome. Picture - Under-wing aerial refuelling pods fitted to the H-6U tanker variant. Xian HY-6 (Hongzhaji You-6) - First successful in-flight refuelling tanker variant in Chinese service. Retained PV-23 fire control system of H-6 and thus can still be deployed as a missile launcher. Xian HY-6D - First aerial refueling tanker for PLANAF, converted from H-6D. The most distinct difference between HY-6U and HY-6D is that HY-6U has a metal nose cone, while HY-6D still has the transparent class nose. Like the original HY-6, PV-23 fire control system is also retained on HY-6D, which enable the aircraft also serves as a missile carrying and launching platform. Xian HY-6DU - Aerial refuelling tanker for the PLANAF, modified HY-6D, also referred as H-6DU. Similar to HY-6U, HY-6DU is a dedicated aerial refueling tanker when its PV-23 fire control system is removed from the aircraft. Xian B-6D - Export version of the H-6D. H-6 Engine Testbed - One H-6, serial number # 086, was converted into an engine testbed. Remained in service for 20 years until replacement by a converted Ilyushin Il-76. H-6 Launch Vehicle - Proposed variant intended to launch a 13 tonne Satellite Launch Vehicle at an altitude of 10,000 m. In 2000 preliminary studies began on the air-launched, all solid propellant SLV, capable of placing a payload of 50 kg in earth orbit. Mock-up of the SLV and H-6 launch platform shown during 2006 Zhuhai Air Show. Xian H-6I - Modified version powered by four Rolls-Royce Spey Mk 512 turbofan engines, originally purchased as spare engines for Hawker Siddeley Tridents in service with CAAC. Modifications included a lengthened fuselage and smaller engine nacelles with smaller air intakes in the wing roots, where the original two turbojet engines were replaced with two Spey turbofans. Two more Spey engines mounted on pylons, one under each wing, outboard of the undercarriage sponsons. Ferry range increased to 8,100 km (with standard payload), and combat radius increased to over 5,000 km (with nuclear payload). Development began in 1970, maiden flight took place in 1978 and state certification received in the following year. Xian H-8I - On 23 March 1970 the No.603 Research Institute was tasked with developing a strategic bomber to be designated H-8, to reduce costs and development time the Xian H-6 airframe was used as a baseline. Two powerplant options were studied, using four WS-6J (Type910) turbofans or six Pratt & Whitney JT-3D turbofans but no aircraft were built. Xian H-8II - An even more ambitious evolution of the H-6 was to have been powered by six WS-6J turbofans in nacelles spaced evenly along an increased span wing, and possibly a re-designed flight-deck with an extended solid nose. Very little information is available on theis project and no aircraft were built. Egyptian Air Force - "Some" B-6 acquired post-1973 along with spares for the Egyptian Tu-16 fleet. Last aircraft retired in 2000. Iraqi Air Force - Four H-6D, armed with C-601 missiles, acquired during Iran-Iraq War. All destroyed in the 1991 Gulf War.